Four players from three clubs added up to one championship and almost two during the third annual Nine, Wine and Dine Tournament on August 28 at Wyoming Golf Club. 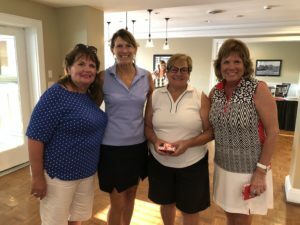 Kenwood Country Club’s Barb Goila captained a team that included KCC’s Kris Schwein, Terrace Park’s Robin Smith and Highlands’s Carol Kessling that teamed to shoot a one-under par 36 and win the Low Gross championship. The team of Katherine Wallace, Jean Schmalsteg, Terri Proud and Michelle Staarman finished second with a 38. 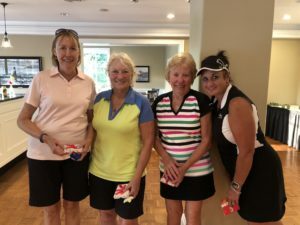 The winning Low Gross team also finished with a 31.20 net, which would’ve been second to the winning score of 30.40 logged by the Miami View team of Mary Oberle, Mary Bross, Joanne Schrand and Jude Haverkos. The 31.45 net carded by Peggy Eichold, Jeanne Rueger, Debbie Bigner and Kathie Heisel was the official Low Net runnerup score. Balance was the key to the Low Gross title, Goila said. “We ham-and-egged it,” she said. “I won the long drive contest at Kenwood this year. This was my second year winning the senior long drive. I just turned 70. I’ve won it four times overall. I grew up on a driving range, and when there was nothing else to do, you’d go hit a bucket of balls. I should’ve played more miniature golf. My husband says I putt like I drive. “My drives were pretty good. Kris Schwein is an excellent putter. Robin and Carol managed to hit some in-between shots. Everything clicked. I think we only had one bogey.” This was the first time both winning teams had played together, the captains said. “It was a surprise to us as well, because we ended up with a score of par,” Oberle said. “We just thought that par would not be enough to win anything with all of the competition out there. We were grateful that we won. Twelve four-player teams competed on Wyoming’s nine-hole course in a “drop-out” format, also known as “step-aside.” Each player tees off and, after the best drive is identified, that golfer “drops out” or “steps aside.” The other three play the rest of the hole under the same format until it’s completed. “I would say Judy is our strongest driver,” Oberle said. “She definitely can get the ball out there You have to strategize and decide who plays the second shot, who plays the chip shots. We had to decide who would make approach shot to green. The hilly Wyoming course can be difficult, both captains agreed. “It can be difficult,” Goila said. “It’s a challenging little nine-hole course. It’s hilly, and there are some water holes you’ve got to go over.” “It’s a great course – very challenging,” Oberle added. That just made the day more fun. As suggested by the title, there’s more to the Nine, Wine and Dine than just golf. This year’s menu included bars of Mexican and Italian food and an ice cream bar, as well as wine. This entry was posted in Articles by Kimberly Wind. Bookmark the permalink.